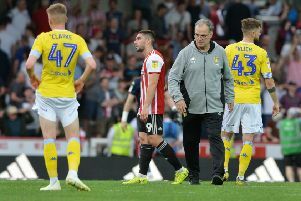 The penalty shoot-out Carabao Cup win over Burnley has allowed Leeds United to quickly draw a line underneath their disappointing first loss of the season, but head coach Thomas Christiansen will also have hoped his players have learned a valuable lesson that they were taught last Saturday. Riding high on top of the table after five wins and two draws from their first seven Sky Bet Championship games, the Whites could not have gone into the game at Millwall in better spirits, but to say they left with tails between legs would be an understatement. While a 1-0 defeat does not look too disastrous on the surface and the unbeaten start had to end at some time, the manner of the loss was more worrying. Despite the close final score Leeds were completely outplayed all round the pitch by opposition who are in the bottom half of the table, but appeared to want the points more. It was rude awakening for some of United’s new boys, good players all it would appear, but who may not have experienced an atmosphere like they faced at The Den and they will have to quickly learn from that with tough trips coming up in the next couple of weeks to Cardiff and Sheffield Wednesday. Before then comes a return to home soil against Ipswich Town this Saturday, another side like Millwall who will aim to get in the Whites’ players faces and deny them the space to play the attacking football which has quickly become a trademark of the Christiansen era. Ipswich, under manager Mick McCarthy, have always proved hard to beat with their no frills football and they travel to Elland Road with an impressive start to the campaign behind them - they are only two points behind Leeds with a game in hand. Leeds boss Christiansen faces some interesting selection decisions after admitting the performance of some of his players at Burnley in a team showing nine changes from the Millwall game had given him food for thought. goalkeeper Andy Lonergan marked his first appearance back at the club by making some crucial saves, including a decisive one in the penalty shoot-out. Gaetano Berardi proved he is back to full fitness at full-back and forward Pawel Cibicki showed his worth on his debut. “It says a lot about my squad, that I have a lot of players to choose,” said Christiansen. “This gives me more headaches. It was a tough and long game but we came here with the intention to pass to the next round.